There’s nothing that screams summer more than a big barbeque with your family and friends. 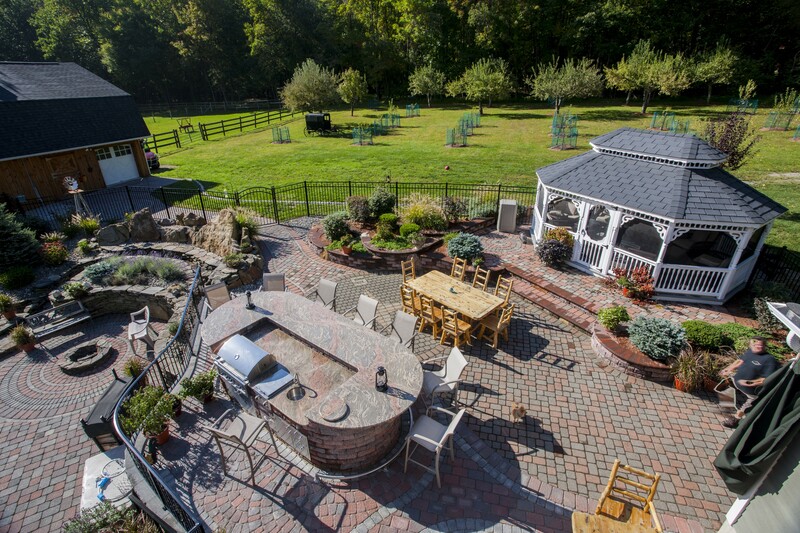 In the day where the traditional propane grill is being supplemented with smokers, pizza ovens, and outdoor bars, why not frame your outdoor kitchen with a stone that is durable, beautiful, and will set the backdrop for the most functional and impressive outdoor barbeque. Let’s be honest, we grill in the summer because it’s easy, delicious and relatively mess-free. You don’t have to spend hours scrubbing pots or worry about heating up the kitchen as you roast a chicken on a hot day. 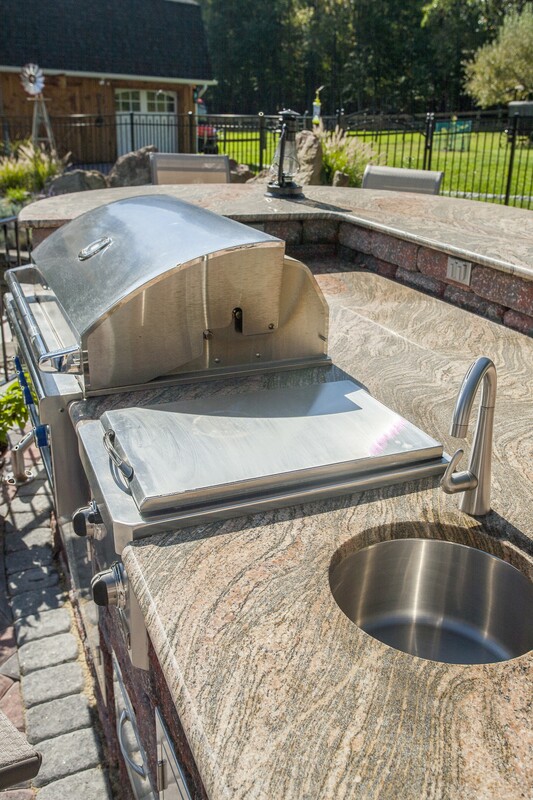 The grill itself does simplify matters, but the addition of a full outdoor grilling station complete with a sink and refrigerator and even more can be a game changer. When selecting the surface for your outdoor countertops, you need to select a stone that is durable and can handle the outdoor elements. Your options for outdoor countertops are limited to natural stone, concrete, or tile. Manufactured quartz is not a food choice because the pigments do not do well when exposed to extreme temperature changes. At Marble.com, we recommend granite for outdoor countertops. It is an obvious choice because is strong and stain resistant and will not fade in the sun like other stones. Further, it is doesn’t stain with regular sealing. Sealing should be done once or twice a year. For simple instructions on how to seal, click here. I would suggest a lighter color so that it does not overheat. Soapstone is another natural stone choice for outside grilling stations. It is non-porous and does not require the annual sealing that granite does. It is heat, stain, and sun resistant, making it an excellent alternative to granite. Marble, travertine, and limestone are far too porous to have last outside exposed to the elements. Another reason why we love granite for an outdoor countertop is that it serves as an ideal surface for a prep station. Granite is heat and stain resistant with proper sealing, so you can put your hot pots on it without worrying about stains or burns. You can cut on it if you wish, but I prefer to use a cutting board to extend the lives of my knives. When designing your outdoor kitchen, make sure to leave as much space as you need to prepare your meals. The addition of an outdoor sink is not one that you will regret and serves as a major convenience for both rinsing dishes and washing hands. We recommend stainless steel sinks because they are low maintenance and perfect for outside. Take time to select the best grill for your needs. It should be the right size for your family and entertaining needs. Too small, and you will have a hard time with proper plating of food, but too large and you might be wasting propane. 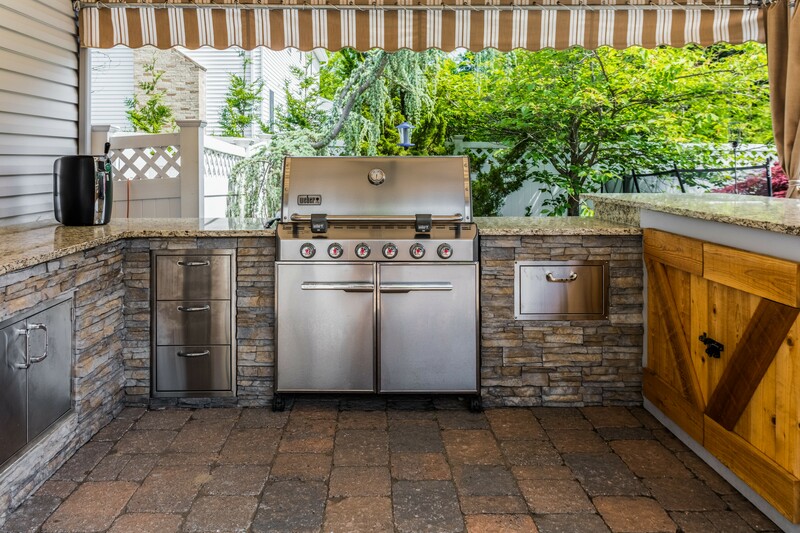 While traditionally most may argue that the grill is the most important cooking device in an outdoor cooking station, the rise in popularity of smokers, outdoor pizza ovens, and even warming racks, present a new way to increase the capabilities of your outdoor kitchen. Like grills, smokers come in all sizes and price ranges. If you consider yourself to be a real avid grill master, you should consider incorporating a smoker into your space. We can frame everything in your kitchen with stone from the grill to the smoker. With the addition of a pizza oven, you will never be calling for pizza delivery again. One last item that we suggest adding to the outdoor kitchen is an extra burner. It’s excellent for warming sauces boiling water and much more. You can have one built into your grill or you will have a much stronger flame if you build a separate burner. It goes without saying that you will want access to cold beverages while cooking outside, so a refrigerator is a must. Depending on the location of your outdoor kitchen, you could even add a dishwasher so that you don’t even have to go into the kitchen on nights when you are cooking and dining outside. 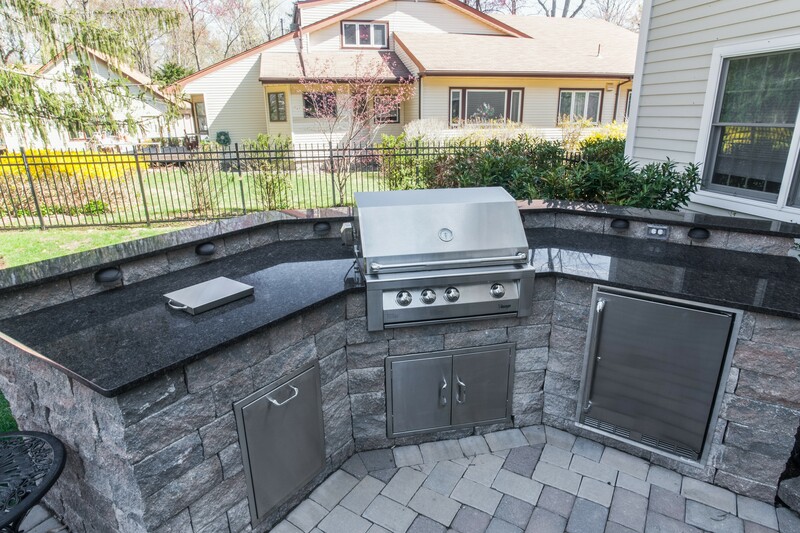 Once you have made the investment of adding all the above to your outdoor kitchen, the final incorporation of a granite peninsula can help bring your outdoor kitchen together. In addition to adding additional storage underneath, paired with a bunch of bar stools, it becomes the perfect place for your guests to relax as you cook them a delicious dinner.